Lyes Hdg 1 year ago. Android Marshmallow ROM, Lineage OS 13 for Galaxy Grand Neo Plus has now arrived via an UNOFFICIAL and OFFICIAL build. If you want some more Lineage OS ROM builds then stay tuned to the Lineage OS 13 ROM page and Lineage OS 14.1 ROM or the latest LineageOS 15 ROMs page. This LineageOS 13 based on Marshmallow for Galaxy Grand Neo Plus is brought to you by Dev4Perf. No donation link found for Dev4Perf. THIS IS AN INITIAL BUILD WHICH MAY HAVE MANY MORE BUGS THAN YOU CAN IMAGINE. HAVE A BACKUP BEFORE FLASHING THIS AND TRY AT YOUR OWN RISK. Installing a custom ROM on a Galaxy Grand Neo Plus may require the bootloader to be unlocked, which may VOID your warranty and may delete all your data. Before proceeding further you may consider backup all data on the phone. You are the only person doing changes to your phone and I cannot be held responsible for the mistakes done by you. Then Copy the GApps and Lineage OS 13 for Galaxy Grand Neo Plus ROM ZIP to your phone. First flash the Galaxy Grand Neo Plus Lineage OS 13 ROM ZIP from device. Then flash the GApps zip from your device memory. 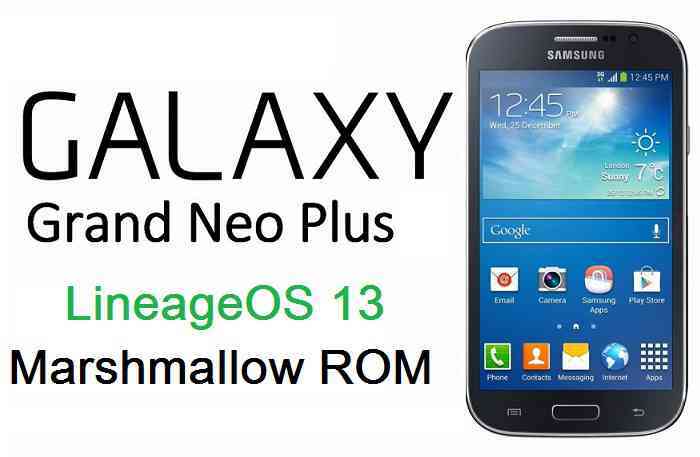 Reboot and Enjoy the Marshmallow Lineage OS 13 ROM for Galaxy Grand Neo Plus. Copy the latest Lineage OS 13 for Galaxy Grand Neo Plus ROM ZIP file to your phone. Stay tuned or Subscribe to the Galaxy Grand Neo Plus (i9060i) forum For other Android Custom ROMs, Lineage OS 13 ROMs, other ROMs and all other device specific topics. For me it’s working just fine. Great job! As @tequue has confirmed that it is working fine for him, can you re-flash the ROM once more and see if it boots ?? turns on and off when a message appears or arrives. rotation does not work (5 seconds or just started rotation works then stops working. each with the screen lock does not turn on. update lineageOS from info signal device “no connection try again later”. this gorgeous rom works great thanks thanks thanks. Hello, I have a problem installing GApps. It’s Error 70: Insufficient space in system partition. For what I hace found, when flashing the ROM, the system partition shrinks from its oiginal 1162 MB to 673 MB, and the image fills 668 of them, so I understand that the system partition is resized to the size of the image, leaving no room for any apps. I can’t resize system partition from TWRP. Could it have something to do with it? Is there a way to change it? Thank you very much! The ROM seemed to work great, but without Google Apps. cat /etc/fstab and look for the system partition in /dev (something like /dev/block/mmcblk0p23). e2fsck -f /dev/block/mmcblk0p23, replacing /dev/block/mmcblk0p23 by what you found in last step. resize2fs /dev/block/mmcblk0p23, again, replacing it. 4 Flash your GApps package. You should have more room for it, but maybe you can’t install the “Super” anyway. It worked for me after several days of looking for a solution. The LineageOS 13 ROM makes my Grand Neo Plus slow, but now it works! Thanks for the ROM.